Carbondale, Illinois | October 28, 2010 | Clora Mae Baker, Ph.D., Associate Professor at the Southern Illinois University, Carbondale, has been recognized by Elite American Educators for her dedication, achievements, and leadership in higher education. Clora Mae Baker is an esteemed associate professor for the Department of Workforce Education and Development at Southern Illinois University, Carbondale, and the National Vice President of Delta Pi Epsilon. An expert in qualitative and international business research and business instruction, Dr. Baker educates students who are aspiring to teach at the secondary, post-secondary, and university levels. She also trains people for work in the corporate sector. A cancer survivor, Dr. Baker attributes her success in her over 40 year career to her management skills and passion for teaching others. She enjoys helping her students obtain good careers and their youthfulness helps keep her young. Her advice to those aspiring to be educators is to always be enthusiastic and to never stop learning. An alumnus of The Ohio State University, she holds a Ph.D. in curriculum and instruction in professional development in business and vocational education. She is active in the Illinois Business Education Association, Indiana Business Education Association, National Business Education Association, the Society for Human Resource Management, and Phi Delta Kappa International. In her spare time Dr. Baker enjoys keeping her mind fresh by reading various publications, including, Business Education Forum, Education Journal, Education Leadership, and the Delta Pi Epsilon Journal. She also spends time showing her strength as a cancer survivor by volunteering with the American Cancer Society’s Relay for Life. For more information about Southern Illinois University, Carbondale, please visit http://www.siu.edu. 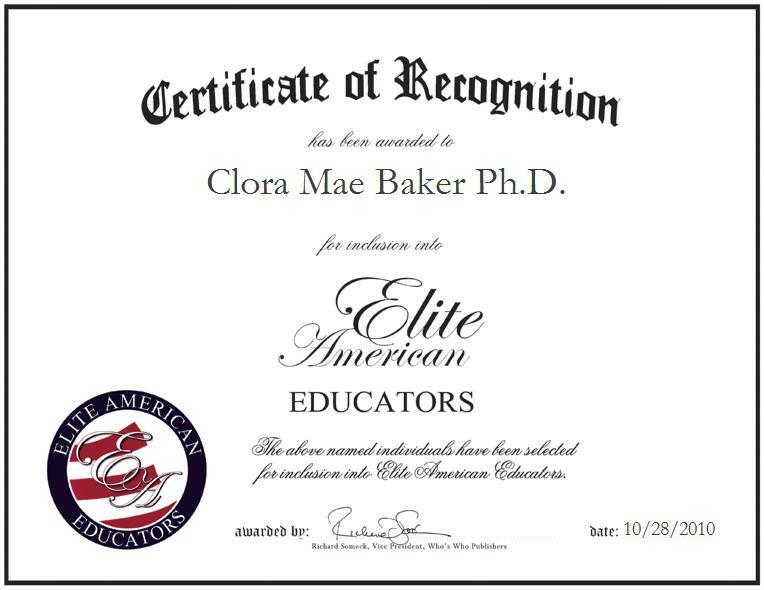 Clora Mae Baker, Ph.D. was originally selected for inclusion in Elite American Educators in October, 2010. We are proud to be featuring Dr. Baker again in Elite American Educators for 2012/2013. Contact Clora Mae Baker Ph.D.